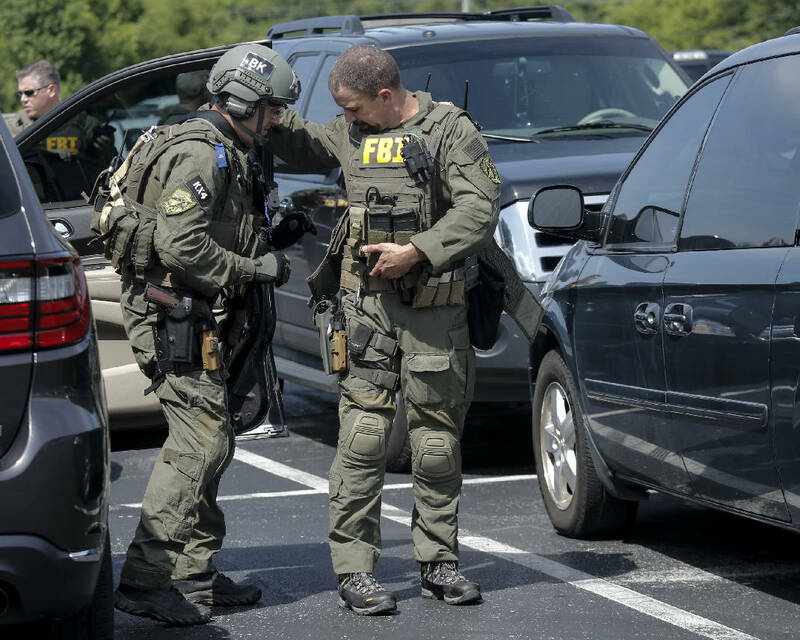 FBI agents prepare in a staging area on Hixson Pike before leaving to investigate the nearby home of gunman Muhammad Abdulazeez on Thursday in Chattanooga. Alexis Tubbs was making a casserole when she looked out her kitchen window and saw half a dozen FBI agents pointing guns at her 14-year-old son. Tubbs' son was playing with his Airsoft gun Monday when FBI agents raided a nearby residence at Mountain Creek Apartments. The raid — at the home of a widowed woman and her six children, Tubbs said — was carried out to investigate a lead about an associate of Mohammad Youssef Abdulazeez. Tubbs said one of the widow's sons knew Abdulazeez. An FBI official in the Knoxville field office said Tuesday he couldn't discuss the ongoing investigation. He said a news conference is scheduled for noon today. "We've been going all over this city talking to friends and associates of our shooter," said Ed Reinhold, FBI special agent in charge, outside the Mountain Creek Apartments on Monday night. "In order to make this investigation completely done, we go around and talk to everyone we possibly can who may know or been associated with the shooter." The family's name was not released. FBI agents were at the complex from about 6 p.m. to 2 a.m. Tuesday, Tubbs said, searching through the apartment and a dumpster on site. "They were just like everybody else," Alexis' husband, Grady Tubbs, said of the neighboring family. "You know, they were a little more quiet and kept to themselves." The Tubbs' 9-year-old son slept over at their place on several occasions, and the children's mother always treated him as part of the family, the Tubbses said. "I'm gonna be real honest, I don't think they were involved," Alexis Tubbs said. "I think him and Mohammad were real good friends, and I think that's the only tie they got." In the beginning of the raid, when the Tubbses' 14-year-old son heard people say "drop your weapons," he assumed it was his friends messing with him, so he playfully pointed his gun in the direction of the voices. The FBI agents did not identify themselves, he said, and he dropped his Airsoft gun when FBI agents came out from hiding and swarmed him. Both parents said their son was just playing in the backyard, not doing anything wrong. "That was the scariest moment of my life," Alexis Tubbs said. Contact staff writer Evan Hoopfer at ehoop fer@timesfreepress.com or 423-757-6731.